Stems: Erect, simple or branched, densely stellate-canescent, prickles to .16 inch. Leaves: Petiole .4 to 1.2 inch; blade linear to oblong or oblong-lanceolate, 1.2 to 6 inches long, .5 to 1.2 inch wide, margins entire to undulate or shallowly sinuate, densely silvery-white stellate-canescent. Inflorescences: Terminal or axillary, racemes or flowers solitary, (1-)3-7-flowered. Flowers: Calyx .28 to .5 inch, 5-lobed, lobes linear-lanceolate; corolla blue to purplish blue, rarely white, .6 to 1.4 inch wide, lobes 5, deltate, spreading, .3 to .6 inch; stamens 5, erect; anthers yellow, .25 to .35 inch. Fruits: Berries yellow or red, eventually turning black, .4 to .6 inch diam., lower 1/2 covered by prickly or prickle-less calyx; prickles to .08 inch; seeds brown, ovate to oblong, .12 to .2 inch, smooth. Habitat: Rocky mixed-grass and shortgrass prairies, roadsides, pastures, stream valleys, and waste ground. 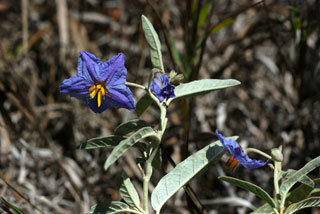 Toxicity: Many species of Solanum are poisonous to livestock, either when fresh or when dried. Symptoms of nightshade poisoning include drowsiness, salivation, trembling, progressive weakness or paralysis, prostration, and unconsciousness. Poisoning may or may not be fatal. Comments: These plants are sometimes grown in flower gardens due to their striking display of silvery-white foliage, bluish-purple corollas, golden anthers, and multi-colored fruits. The specific epithet elaeagnifolium alludes to the similarity of the leaves to those of some species of Elaeagnus.